These wavy, harvest-golden Quinoa Chips are full of the goodness of the ancient grain, Quinoa, one of the superfoods that the Incas referred to as “Mother of All Grains”. 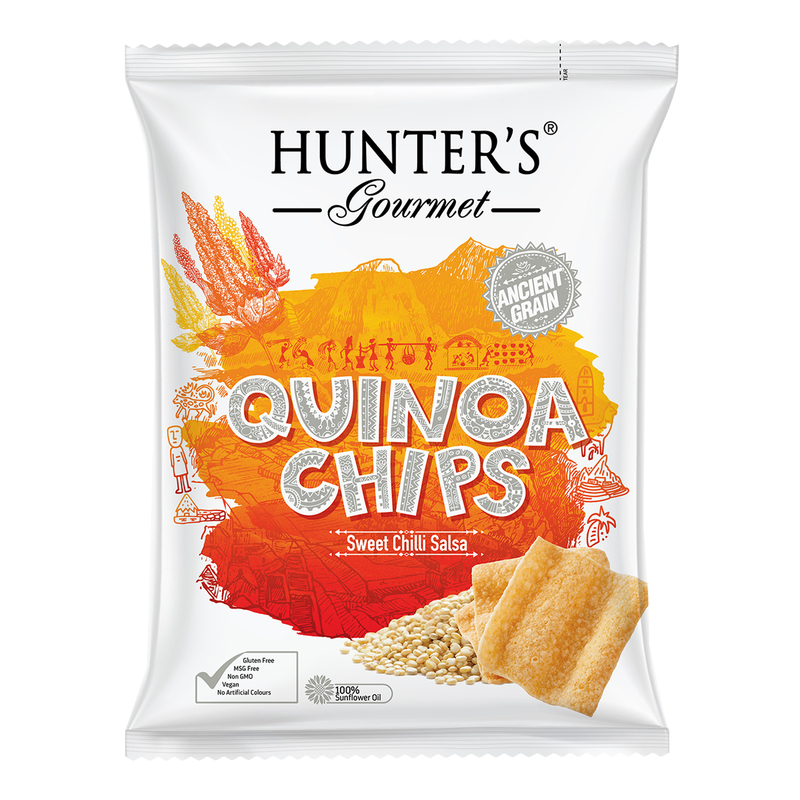 The Sweet Chilli Salsa complements perfectly the wonderful natural flavor of the Quinoa Chips. They are powered with the tangy, sweet, spicy and savory tasting sensations of the awe-inspiring region. In addition, these chips are completely gluten, MSG and GMO free, with no artificial colours, and suitable for vegans! Another delightful addition to our Better for You range of wellness snacks! Quinoa is called an ancient grain because it was domesticated thousands of years ago. The Incas referred to it as “Mother of All Gains”. 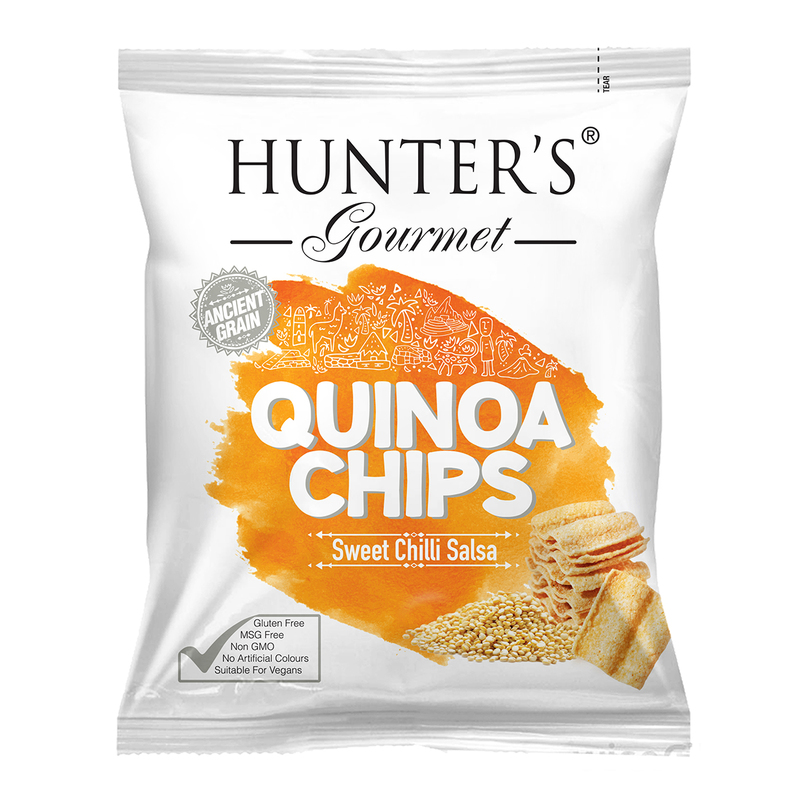 Quinoa Chips – Sweet Chilli Salsa (75m) 75gm Packet. Alternative Snacks, Vegan, Gluten free, MSG Free, Non GMO, No Artificial Colours, No Transfat, No Cholesterol, Dairy Free, Lactose Free. Quinoa flour 28%, sunflower oil, potato starch, corn starch, corn flour, sweet chilli salsa flavour [sugar, salt, rice flour, dextrose, acidity regulator (E262(ii)), yeast extract, onion, coriander, acidity regulator (E330), garlic, turmeric, rapeseed oil, tomato, anticaking agent (E551), cumin, nature identical flavours (mango, tomato, curry, cayenne pepper, ginger), colours (E160c, E100), fenugreek, paprika, black pepper, fennel, oregano, capsicum].Manufactured in a facility that stores and/or packs peanuts, tree nuts and products of gluten, dairy, soya, mustard and celery. Love, love, love this flavour of Hunter Foods. It’s light, crunchy and flavourful. Keeps you wanting more no matter how much you’ve already had.